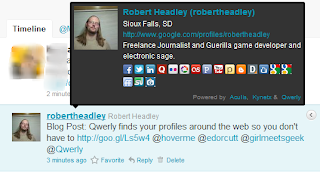 Qwerly is a service that scours the web and locates all of your profiles on the web using some kind of semantic magic or another and puts them all in one place for you. This isn't the first service of this kind that I have seen, there is Peekyou but I would say that Qwerly is decidedly less... creepy. Qwerly even gives you a neat widget that you can embed on webpages, however it appears to only have a white background and does not adjust its size in anyway, so obviously there is some work to be done. Here is my widget, which just happens to work because my posts have a white background. Hoverme is an extension for Chrome, Ie, and Firefox that accesses the Qwerly API to display this information in a helpful overlay. You are welcome. Peekyou scours google to find stuff but also includes a lot of stuff that makes it... creepy. Things like Age, etc. While its true you could go to any one of the sites listed via Hoverme or Qwerly and get a lot of that information, making it easily accessible with a simple search is.. creepy. I enjoy good Semantic and dynamic services and Hoverme and Qwerly qualify.